His image was ubiquitous and his name everywhere as he ruled Uzbekistan with an iron fist for 27 years before his death was announced on September 2, 2016. But just ahead of the second anniversary of Islam Karimov's death, Uzbek officials are reportedly talking much less about Karimov as they focus on his successor, Shavkat Mirziyoev, instead. Several Uzbek state TV journalists say they have been given strict instructions not to mention the late president's name on air. "The managers told us: 'If Karimov's name is heard during your programs you'll [be seriously punished for it],'" one TV moderator told RFE/RL's Uzbek Service on August 22. Speaking on condition of anonymity, the presenter said the employees were told that the order allegedly came from Khairiddin Sultonov, an adviser to Mirziyoev. A chief editor at another state TV station confirmed he'd been given the same order, which he said was issued to all state television and radio channels in the country about one month ago, he said. "It wasn't a recommendation, it was a demand," said the editor, who requested his name not be published. Fearing possible retaliation, Uzbeks are often reluctant to speak to foreign media outlets. "In a [recent] staff meeting...they reminded us about the order once again," the editor told RFE/RL. "Actually, since the beginning of the year we've been advised to talk less about Karimov and instead praise Mirziyoev more." "In the past month, editors are thoroughly checking all texts to remove Karimov's name," the editor said. "Mentioning Karimov's name on air has become riskier than talking about [the founding leader of the banned Islamic Movement of Uzbekistan] Tohir Yuldosh," he added. A journalist from the state Yoshlar (Youth) channel says the "ban" extends to showing Karimov's images and monuments to him in TV reports. RFE/RL's Uzbek Service was unable to get comments from state TV officials about reports of the injunction on Karimov's name and image. Meanwhile, at the Institute of History at Uzbekistan's Academy of Sciences, an employee told RFE/RL that "all portraits of Karimov have been removed from the building along with posters bearing his quotes." And according to a student in Bukhara, all of the books alleged to have been written by the late authoritarian leader were removed from the library at his university and taken away in a truck. There has been no official word about a policy change regarding media mentions or items bearing the image of Karimov. His long rule was constantly criticized by international rights organizations and Western states for its horrific record on human rights and for being void of free media or elections. The UN Committee against Torture found in 2013 that torture was "institutionalized, systematic, and rampant" in Uzbekistan's judicial system. 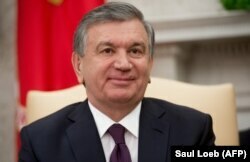 Karimov and his government were also severely criticized for the 2005 Andijon massacre, in which hundreds of antigovernment protesters were killed. But since succeeding Karimov -- under whom he served as prime minister from 2003 to 2016 -- Mirziyoev has actually taken measures to immortalize his autocratic predecessor. 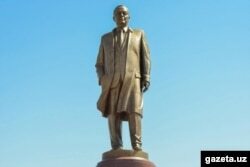 Large monuments were erected for Karimov in Tashkent and other cities and a marble-clad mausoleum with gilded walls and a dome was built in Samarkand, his birthplace. The mausoleum was officially opened by Mirziyoev on January 30, 2018, on what would have been Karimov's 80th birthday. Mirziyoev often takes his high-ranking guests -- including heads of states -- to Samarkand to pay tribute to Karimov. Mirziyoev's most recent visit to Karimov's grave was on August 18, when he brought visiting Tajik President Emomali Rahmon to Samarkand. Just two days later, however, police conducted a raid in the area on merchants selling Karimov memorabilia. On the same day, a similar raid targeted souvenir sellers in front of a Karimov monument in the southern city of Qarshi. Written by Farangis Najibullah based on reporting by RFE/RL Uzbek Service correspondent Shukhrat Bobojon.